Protein is an essential dietary component, but it can be hard to consume enough if your a vegetarian. Here is Bon'App's meat-free guide on how to recieve adequate dietary protein! A wide variety of beans, from kidney and black beans to garbanzo and pinto beans, contain protein. 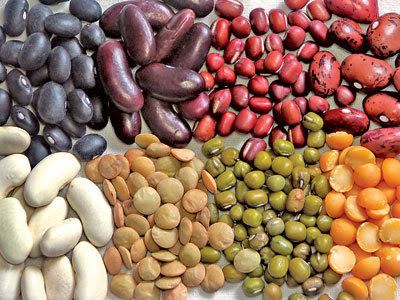 Beans and legumes are also one of the cheapest sources of protein. You can put beans and lentils in almost any dish, including pasta, stir-fry, and salad, and add up to 18-grams of protein! If you are not a vegan, dairy products also provide a great source of protein. In particular, greek yogurt packs anywhere from 15 to 20 grams of protein per 6-ounce serving; the same amount found in a 3-ounce serving of lean meat! Mix in a handful of almonds or walnuts and you will be well on your way to meeting the daily requirement. Nuts also make a great snack, and pack up to 7 grams of protein per 1-ounce serving! So the next time your craving potato chips, why not opt for a handful of pecans, cashews, or pistachios instead? Or try spreading 1 tablespoon of peanut butter onto a slice of whole-grain bread for a tasty treat under 200 Calories. Tempeh, made from fermented soybeans, also provides a substantial amount of protein per serving. Whether crumbled into vegetarian tempeh chili or served as a BBQ tempeh sandwich, a 4-ounce serving of this meat alternative provides a delicious way to meet your dietary protein needs.